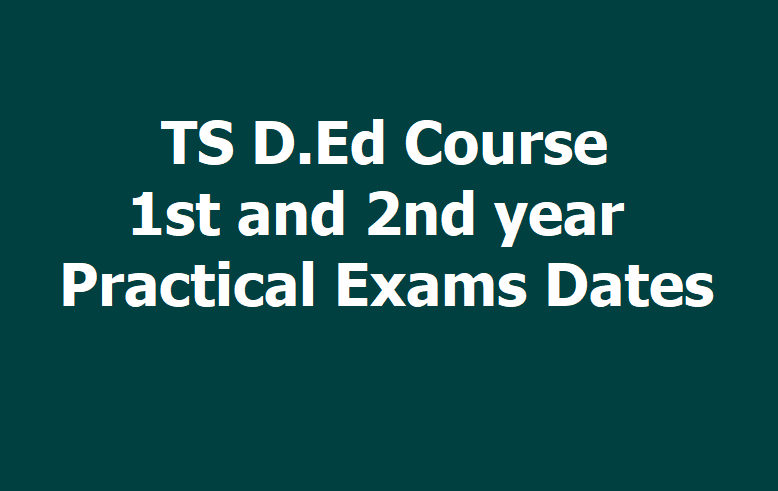 TS D.Ed 1st, 2nd Year Practical Exams Schedule/Dates 2019: DGE Telangana has notified that the Diploma in Elementary Education (D.EI.Ed.) I & II Year FINAL LESSON TEACHING PRACTICALS (FLTP) of 2018-2020 & 2017-2019 batches will be conducted in two spells i.e. from 01-03-2019 to 15-03-2019. The Principals of all private D.EI.Ed colleges in the state are hereby informed to contact the Principal, Government DIET of their concerned district for further information. two spells @ five days each. The first spell shall be from 1st to 15th March 2019 and the second spell shall be from 1st to 15th March 2019. The Principals of DIETs would see the proper arrangements are made by all private D.El.Ed. colleges concerned in order to conduct the D.El.Ed Practical Examinations smoothly. D.Ed Course 1st & 2nd year Final Lesson Teaching Practicals (FLTP) of 2018-2020 & 2017-2019 batches will be conducted in two spells i.e. from 01-03-2019 to 15-03-2019. The Principals of DIETs would conduct a one day Orientation meeting with Principals and all faculty members working in all Private D.El.Ed colleges of their respective districts before the commencement of D.El.Ed I and II year Practical examinations. They will guide and appraise them about their role in successful conduct of practical examinations and allot the lectures of Private D.El.Ed. Colleges into subject wise groups. Each group shall be headed by the Senior lecturer/ Lecturer of DIETs to guide them in a detailed manner to discuss the concerned subjects. The Principals of DIETs will record the attendance of faculty one day Orientation meeting members based on the staff list approved by the Director, SCERT, Hyderabad and send the report to the Director, SCERT, TS, and the Director, Govt. Examination, TS, Hyderabad.